"Meet my twins Elsa (little girl) and Eli (big boy). They are from the same litter and boy are they different! 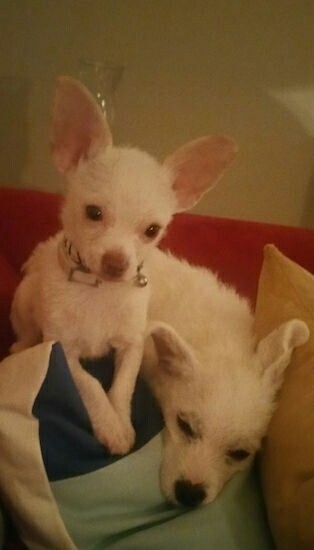 Elsa was the runt but she is definitely the dominant one. Eli is a tad skittish and never barks but incredibly sweet. Elsa is my diva, small but fierce. She barks if I move wrong. They have great chemistry and I am obsessed with my kids." The Chigi is not a purebred dog. 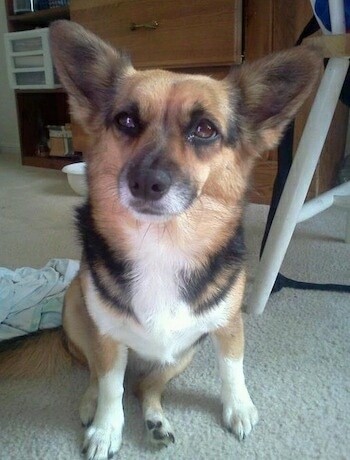 It is a cross between the Chihuahua and the Corgi. The best way to determine the temperament of a mixed breed is to look up all breeds in the cross and know you can get any combination of any of the characteristics found in either breed. Not all of these designer hybrid dogs being bred are 50% purebred to 50% purebred. It is very common for breeders to breed multi-generation crosses. Oliver the Chigi at 1 year old (Chihuahua / Corgi mix)—"Oliver is very lovable and playful! I rescued him and it was the best decision I ever made." Dash, Welsh Corgi / Chihuahua hybrid at 3 years old—"We've been calling him a Corhuahua, but we see you have it listed as a Chigi here! He is lying in his dog bed that looks fit for the king that he thinks he is!" 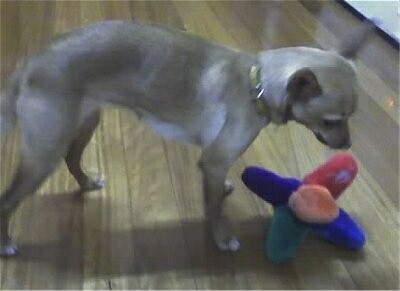 "I would like to introduce you to my little Chigi Frida, shown here at 6 years old. 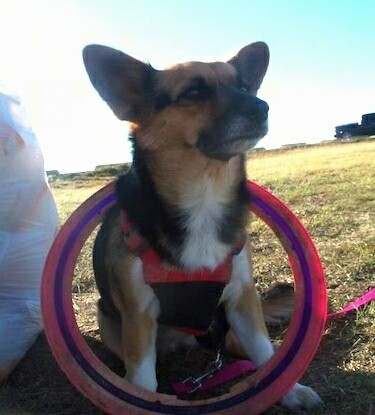 She is a Chihuahua / Corgi mix and my pride and joy. She weighs about 7 pounds and is much smaller than I expected her to be! She is a great little dog, but can be kind of snotty sometimes. For instance, she sleeps on my bed with me, but if I get too close at night she growls. Also, she's not very good with kids. I just finished reading your page on Small Dog Syndrome and I think I know what the problem is: she thinks she is the boss of me. As recommended, I think I will look into the Dog Whisperer. "OK, enough about her negative qualities. She is a very happy little dog. She loves to play with Piggy, which is a stuffed animal she's had since she was a puppy. It is the same size as her, but she manages to drag him around everywhere. She loves her boyfriend Simon. He is a 100-lb. Rott / Lab mix. 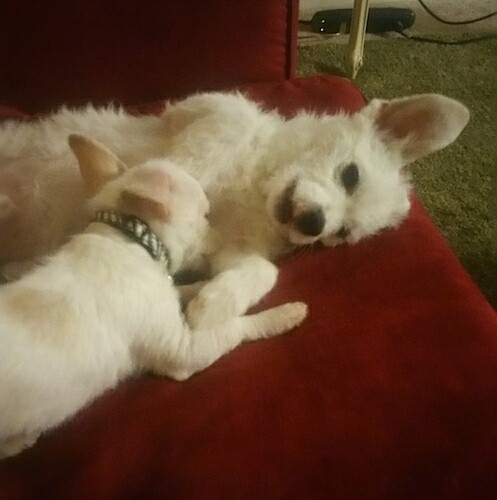 So far, he is the only dog that she really, really likes. Any other dog, no matter what the size, she would be trying to dominate. 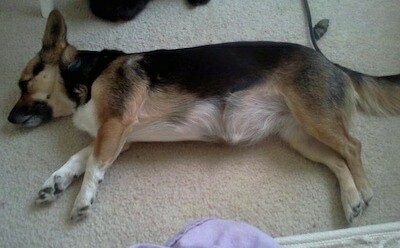 When I got her, I was very relieved to find she didn't get the Corgi eating habits. Any other corgi I've ever had would eat themselves to death. Frida, on the other hand, is kind of picky and is actually meticulous when it comes to eating. She always eats exactly half of her bowl and then saves the rest for later. When I say half, I mean she eats the right half or the left half and there is always a nice, neat line down the middle! "By getting a mix, I was hoping to avoid some of the health problems purebreds get. I managed to avoid the skin problems and allergies some Corgis are susceptible to, but in exchange Frida has had more serious health problems. She's had two intestinal infections, one rather serious (and expensive! ), and has had 3 seizures this year. The vet still can't figure out what is causing the seizures. On top of that, she was attacked by another dog when she was a puppy, which resulted in surgery and a night in an animal hospital. All the vet visits keep me on my toes, though, and remind me of how lucky I am to have her." 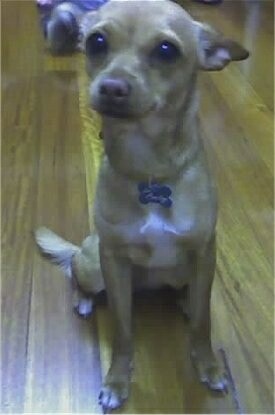 Crash the Chigi at 3 years old—"Crash is a lovely dog! I adopted her when I was 15, as my first dog that I took full responsibility of. Her mom is a Chihuahua and her dad is a Cardigan Welsh Corgi. She had me from the moment I laid eyes on her! 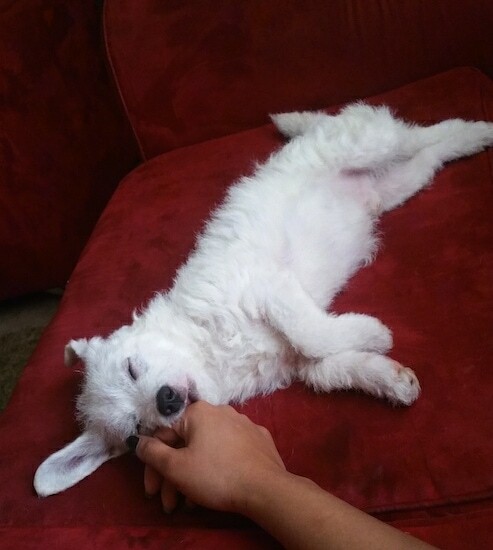 She was a VERY unique dog, always very playful but could not be separated from me. We bonded, more than I've ever bonded with a dog before. She slept with me, I walked her daily, I trained her, everything. Well, when she was a year and a half old, in December 2010, she came down with Parvovirus. It was devastating. I hadn't had the money to get her shots or fixed yet, I had JUST started my first job. I begged for help on Craigslist and a lovely woman brought me some shots, two IV packs, Pedialite and Science Diet wet food...and from there on, it was a waiting game. I stayed out of school for two weeks, sleeping on the floor with her as she battled the disease. She wouldn't eat and the Pedialite got into her lungs from all her fighting. She was running out of energy and barely weighed 7 pounds, when she was previously 15 pounds. And all of a sudden, on the 13th day, she walked over to me, licked me, and then walked over to her water dish and drank water...and she began to recover. She survived Parvo! I took her to get ALL of her shots and to get fixed a few months later. She's been with me through absolutely everything. Through my most crucial years of high school, friends, boyfriends. In January of 2012, my family adopted a new puppy and Crash contracted a cold from him. And the cold soon turned to Pneumonia. I almost lost her again, “almost” being the operative word. After a week of battling, she overcame it. Every time she coughs, hacks or vomits I'm on my toes and calling the vet! I got married recently and my husband is Army. We relocated across the country and took Crash with us. Soon, we're going to Japan and she's coming, too. She's my baby girl and my entire world! She's hyper, playful and smart but VERY protective of me. She thinks she's the alpha of anything and everything! She's got Little Dog Syndrome or maybe she just thinks she's a human. She learns very quickly, though. All of my past boyfriends, and my husband, have had to pass the "Crash test." But she's my lovely little baby, and always will be!" 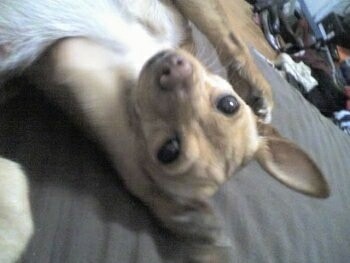 "Brady is an affectionate 9-year-old Chihuahua / Corgi hybrid (Chigi) with a natural gift for performing. He can walk on his hind legs, roll over, speak, dance, twirl, and when you point your forefinger at him and say "bang," he plays dead! He likes to burrow deep into the pile of pillows on our bed, with just his face visible. "Because of food allergies, Brady the Chigi is on a strict vegan diet. His favorite treats are popcorn and baby carrots. When he first developed allergies at the age of eight, he scratched off most of the fur on his chest and abdomen, and had to wear clothing to keep him from doing further damage to himself until the source of the allergic reaction was identified and eliminated. 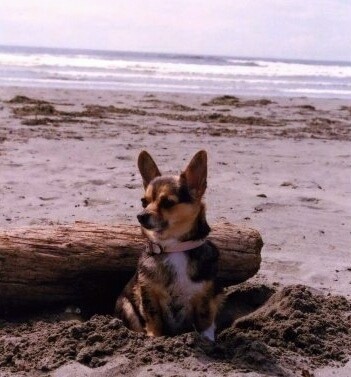 "Brady the Chihuahua / Corgi hybrid loves going to the West Coast to frolic on the beaches and run through the forests...but he always makes sure his people aren't far behind! He is 7 years old in this picture, but still acts like a puppy." 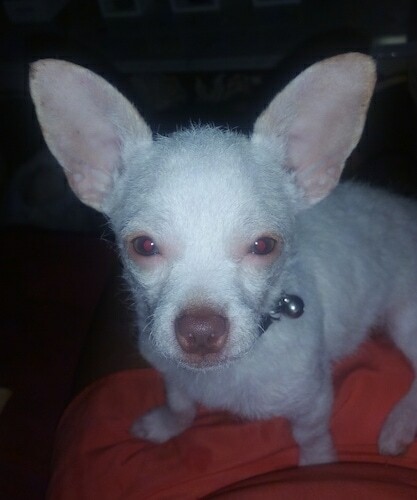 "Brady the Chigi, or Chihuorgi, as we like to call his hybrid was born in Toronto, but now lives in Victoria, BC, Canada. He is very smart and affectionate, and the centre of his "parents’" lives. He likes camping (so long as he has his own camping chair), hiking, and long walks on the beach."